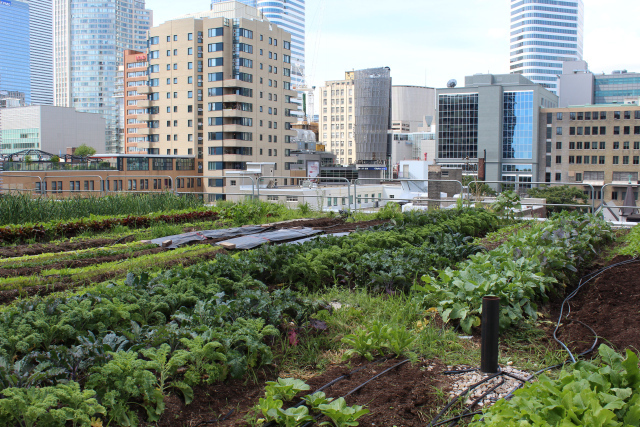 This episode of the podcast features an interview with Arlene Throness, the coordinator of a rooftop farm operated by a Ryerson University Gardening club called Rye's Homegrown, out of Ryerson University in Toronto. The interview was recorded and edited by Ruminant Podcast collaborator Scott Humphries. Check out the photos below...this is no indoor hydroponic setup or series of pots and garden boxes. It's literally a quarter acre market garden on a roof. Arlene talks about the farm's history, as well as the challenges of growing CSA crops way, way up in the sky. Photos taken from Rye's Homegrown website. Click the photos to visit the site. Photos taken from Rye's Home Grown website. Click to visit site.